CBS has ordered three additional episodes of its Code Black TV show. The new pick-up brings the medical drama’s second season episode count up to 16. The network also ordered additional episodes of new comedies, Man with a Plan and The Great Indoors. Code Black stars Marcia Gay Harden, Boris Kodjoe, Melanie Chandra, Harry Ford, Benjamin Hollingsworth, Jillian Murray, William Allen Young, Luis Guzmán, and Rob Lowe. Michael Seitzman, David Marshall Grant, Ryan McGarry, David Von Ancken, Marti Noxon and Linda Goldstein Knowlton executive produce. 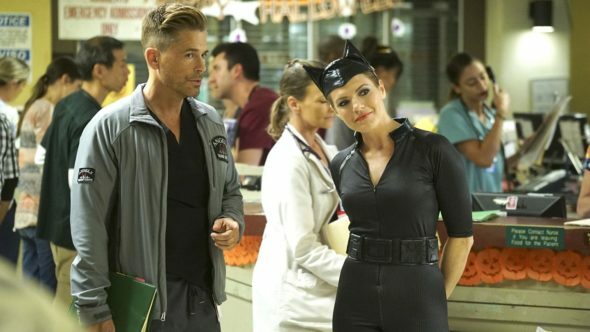 In its first season, Code Black was on the renewal/cancellation bubble. The producers retooled the series, and made cast changes, in order to secure a second season on CBS. In season one, Code Black averaged a 1.27 rating in the 18-49 demographic. The show drew an average of 7.11 million total viewers (live + same day ratings). In the renewal press release, CBS reports Code Black is averaging 7.94 million viewers, 2.1/06 in adults 25-54 and 1.5/05 in adults 18-49. The network cites those numbers as Nielsen’s most current ratings (9/19/2016-11/10/2016). What do you think? Have you been watching Code Black, season two? Do you think it will be cancelled or renewed for a third season? Please keep Code Black on for another season (or 2) . I watch it every week. Keep this show…this is a good show. Code Black is a proud successor or ER. I have bought the two full seasons through Apple Store. I love the reality of the show and how it portrays the human dilemmas, in addition of the ED procedures. KEEP THE SHOW….REALLY A GOOD ONE..
Code Black is a wonderful show; it’s intelligent, fast-moving, has an actual story and plot and the actors are incredibly good (unlike almost ALL of current television reality stupid shows). Please continue this series! Love this show and hope to see lots more episodes!!! Code Black is awsome I think you need to put on diffrent day like Friday or Saturday Sat. night has nothing to watch I turn on Netflix I love Code Black please no more reality shows. This series is great! Always exciting, moving ang a great cast. The first medical show that did not put this medical professional asleep. Code black is the best tv show on tv. It’s realistic, not like those made up reality none sense shows. The relationships are realistic and the dialogue has me crying at every show. This is the only show I watch. Please keep it going. Mayb it just needs a different time slot. Please Please DO NOT CANCEL Code Black. Absolutely great! I have kept the last season on my DVR so I can watch them again this summer. There are so little good programs to watch on any of the networks anymore it would be a shame to kick this GREAT show to the curb. Fingers crossed for many more seasons. We love Code Black and it’s a date every Wednesday. Marcia Gay Harden(Dr. Rorash) and Luis (Mama) Guzman, are steady and thoughtful in there performances. It’s suspenseful and can leave you drained, but usually warms your heart in one way or another by the end of each show.